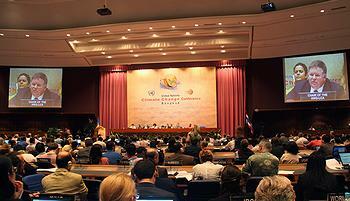 BANGKOK, Thailand, April 6, 2011 (ENS) – The first round of UN climate change talks since the Cancun summit in December is underway in Bangkok this week. Negotiators from 173 governments are supposed to build on the Cancun agreements and work towards establishing a new global climate change regime, to extend or replace the Kyoto Protocol, when its first commitment period expires at the end of 2012. But the talks are stalled over the agenda for negotiations. Developing country representatives want the Kyoto Protocol to be continued without a gap and the demand that rich nations reduce greenhouse gas emissions. Japan, Canada and Russia oppose a second commitment period from 2013. Developed country delegates want a broader agreement that commits all major economies to limiting greenhouse gas emissions. The talks are taking place as unprecedented heavy flooding in southern Thailand has claimed the lives of more than 50 people. More than a week of heavy rain has unleashed floods in 10 of Thailand’s 77 provinces, submerging homes, causing landslides and washing out roads and bridges. More than a million people have been affected and at least 500,000 have been forced into temporary shelters. 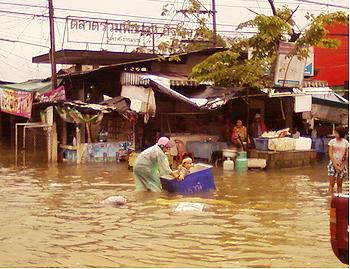 On Tuesday, the Thai cabinet approved nearly US$100 million in assistance to flood victims. The floods were likely caused by climate change, Thailand’s deputy chief negotiator for the UN Framework Convention on Climate Change said as talks opened on Sunday. Addressing delegates Monday, the top United Nations climate change official, UNFCCC Executive Secretary Christiana Figueres, expressed “solidarity with the people of Thailand, who are currently suffering from unprecedented flooding and mudslides in the south of the country.” She led the audience in a moment of silence to honor the dead. Governments must agree on emission reduction targets and actions which will allow the world to stay below the maximum temperature rise of two degrees Celsius above pre-industrial levels, she said, a target set by governments in Cancun. This is the temperature restriction that most scientists say will help avert the worst consequences of climate change – melting polar ice caps, sea ice and glaciers, sea level rise, floods, droughts, wildfires, food and fresh water scarcity, species extinctions, and the spread of tropical diseases. 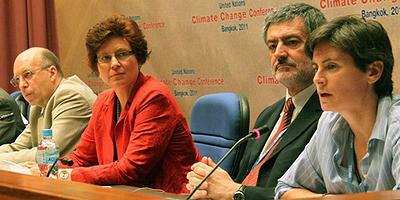 Many climate advocates want to see temperature rise limited to 1.5 degrees Celsius above pre-industrial levels. 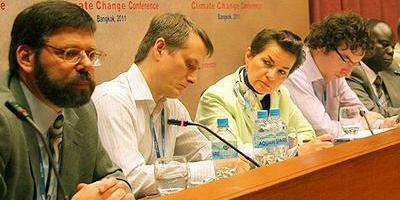 “It is important that the agreed actions and institutions are delivered on time and in accordance with the deadlines agreed in Cancun so that the broader global climate regime is up and running in 2012,” Figueres said. The institutions include a Green Climate Fund to house the international management, deployment and accountability of long-term funds for developing country support. Developed and developing countries have agreed that a Green Climate Fund of US$100 billion is needed annually for developing countries to combat and adapt to climate change. This amount cannot come from the public revenues of developed countries alone. Innovative financing, from emissions markets to new levies on financial transactions or on international shipping and aviation, will be required. Other institutions agreed at Cancun include a Technology Mechanism to promote clean technologies; and an Adaptation Framework to boost international cooperation to help developing countries protect themselves from climate change impacts. “But so far, the Bangkok climate talks have not changed the gap between emission reduction pledges and what is to needed to get the world on track for limiting global warming to 2 and 1.5 degrees C above pre-industrial levels,” according to Climate Action Tracker, an independent science-based assessment, which tracks the emission commitments and actions of countries. After two days of pre-negotiations workshops April 3 and 4, and the first two days of negotiations, “No developed country attempted to increase their reduction target as it was requested in Cancun Agreements and in the mandate for the workshop held in Bangkok,” said a Climate Action tracker briefing paper released today. “Only few countries clarified their actions to the extent that it would raise the ambition, but the effect of most countries’ clarifications is unclear,” the assessment states. Some 1,500 participants from 173 countries, including government delegates, representatives from business and industry, environmental organizations and research institutions, are attending the talks in the Thai capital, which are scheduled to conclude on Friday.